High blood pressure is one symptom that’s usually mentioned in the same breath as diabetes and obesity, but even young and healthy people can suddenly be diagnosed with it for no apparent reason. What actually is this problem, and how can a Paleo diet help you deal with it? 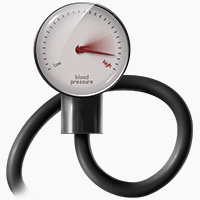 Blood pressure is really a measure of how strongly your blood is pushing on the walls of your arteries. It’s recorded as two numbers. The higher number is systolic pressure, the pressure when your heart is actually beating. The lower number is diastolic pressure, or the pressure between heartbeats. Doctors record blood pressure as systolic over diastolic. For example, if you have a blood pressure of 110/75, your systolic pressure is 110, and your diastolic is 75. In general, healthy people should have a systolic of less than 120, and a diastolic of less than 80. High blood pressure, or hypertension, is a pattern of systolic readings over 140, and/or diastolic over 90. It’s a particularly sneaky problem, because it can be asymptomatic for years, especially among young and healthy people who think of blood pressure as a problem for fat middle-aged men. It’s also tricky to diagnose properly, since readings can vary from hour to hour, and some people have abnormally high blood pressure in the doctor’s office simply because they’re stressed out about having their blood pressure taken. To make things even worse, the vast majority of hypertension can’t be pinned down on any one cause – sometimes there’s a physical abnormality in the kidney, but the most common diagnosis is “essential hypertension:” in other words, the doctor doesn’t know why your blood pressure is so high; it just is. We know about several associated risk factors, discussed below in more detail, but risk factors and causes are definitely not the same thing. Despite the difficulties in diagnosis, it’s clear that high blood pressure is quite a widespread problem – the CDC estimates that almost 1/3 of US adults are hypertensive. High blood pressure is a contributing factor to a whole slew of cardiac and kidney problems, most famously stroke. It’s not completely clear that high blood pressure itself is the cause of all these conditions (it might just be a co-occurring symptom), but at best it’s a bad sign. “Blood pressure” isn’t just about your blood. The renin-angiotensin-aldosterone system (RAAS) is the network of organs and hormones that regulates blood pressure and the balance of fluids in your body; it involves not only the heart and the arteries, but also the liver, kidneys, lungs, and pituitary gland. In other words, high blood pressure is not a disease of anyone particular organ; it’s a systemic problem that affects all parts of the body. The most important organs involved in the RAAS are the kidneys. Their job is to filter waste from the body and maintain a balance of minerals and body fluids. If the RAAS is activated, the kidneys remove less fluid and reabsorb more sodium and water. This causes blood pressure to rise. Chronically high blood pressure, which damages the walls of the arteries, makes it even harder for the kidneys to do their job, so a vicious cycle of kidney dysfunction and hypertension often results. As well as being regulated by the kidneys, the RAAS is also governed by the central nervous system, which can be divided into two main groups of responses. The sympathetic nervous system is the “fight or flight” response. Increased activity of the sympathetic nervous system activates the RAAS, so it contributes to essential hypertension: this is why people talk about their “blood pressure going through the roof” when they’re angry or stressed. In contrast, the parasympathetic nervous system is the “rest and digest” mode that supports healthy blood pressure. It’s dominant when you’re relaxed. Since it’s such a complicated problem, there’s no use looking for the “one true cause” of high blood pressure. But examining the risk factors for essential hypertension (hypertension without any obvious physical cause) can give us an idea of how it might operate as part of an overall state of poor health and systemic inflammation. One of the biggest risk factors for high blood pressure is diabetes – approximately 10-30% of Type 1 diabetics, and 60% of Type 2 diabetics are also hypertensive. This makes hypertension an acknowledged part of the metabolic syndrome, the incredibly complicated group of problems related to diabetes and obesity. Specifically, insulin resistance is likely to be one of the major contributing factors to essential hypertension, even in lean people. A 2003 study found approximately 50% of patients with essential hypertension to be insulin resistant. How do scientists explain this connection? First of all, metabolic syndrome increases the activity of the sympathetic nervous system. In particular, two hormones in the blood, insulin and leptin, are involved in this process. People with metabolic syndrome are often insulin and leptin resistant, meaning that their body has to produce higher than normal amounts of these hormones to get the message through to their cells. The excess insulin and leptin in the bloodstream triggers the sympathetic nervous system, activating the RAAS and causing the kidney to reabsorb more water and sodium. Through the stimulation of the sympathetic nervous system and RAAS, insulin resistance and obesity also act directly on the kidneys, prompting them to reabsorb more sodium. There is also some evidence that the hormones released by abdominal visceral fat (the “apple shape” associated with metabolic syndrome) are involved in activating the RAAS. Insulin resistance also prevents the endothelium (the layer of cells lining the blood vessels) from producing enough nitric oxide. Nitric oxide is relevant because it’s a vasodilator: it widens blood vessels to allow more blood to flow through them. If you don’t have enough nitric oxide, your blood vessels will be too narrow, even though your body still needs the same amount of blood. The same amount of blood squeezing through the smaller space produces hypertension. Another article connects oxidative stress, insulin resistance, and immune dysfunction to hypertension as a closely linked trio of inflammatory conditions. Immune reactions and insulin resistance generate AGEs, which increase oxidative stress and lead to the release of inflammatory cytokines, decreasing nitric oxide production and promoting inflammation. The short version is that the relationship between metabolic syndrome and hypertension is as complicated as metabolic syndrome itself. There are so many diseases related to obesity and insulin resistance that it’s almost impossible to detangle them all and find clear connections between one and the other. But there are several plausible mechanisms that might explain why diabetes and insulin resistance are so strongly correlated with the risk of hypertension, and why so many diabetics are hypertensive (and vice versa). On the flip side, this means that one of the most effective treatments for hypertension should be treating the underlying metabolic syndrome. Studies on insulin sensitizing drugs have born this theory out: these drugs tend to have beneficial effects on blood pressure. Weight loss, exercise, and other insulin-sensitizing lifestyle changes are also beneficial. Unsurprisingly, an insulin-sensitizing diet also helps – for more on this, see the “Hypertension and Diet” section below. Hypertension is clearly connected with metabolic syndrome, but what about young, lean, athletic people who seem to have high blood pressure for no real reason? Stress is one potential culprit. Chronic stress keeps the sympathetic nervous system on overdrive all the time, and many people notice that their “high blood pressure” drops significantly when they get out of a lousy job, a bad relationship, or another long-term source of stress. Since metabolic syndrome and diabetes are diseases of the modern Western diet, it’s obvious that nutrition has an important role to play. But are there risk factors beyond a generally obesogenic (grain-heavy, nutrient-poor) diet? First of all, it’s important to clear up the common myth that salt raises your blood pressure. The full article on salt explains it more completely, but the short answer is that the studies done on animals fed them completely absurd amounts of salt, and the studies done on humans showed that the balance of sodium and potassium is much more important than the absolute amount of sodium eaten. In all but a few “salt-sensitive” people, eating salt to your taste won’t have any effect on blood pressure; eating plenty of potassium-rich vegetables (rather than potassium-poor Fritos) with your salt is a better strategy than trying to restrict salt intake. If salt isn’t the culprit, then what is? Clearly, the dietary factors influencing hypertension will be as complex as the problem itself, and anything that contributes to diabetes or metabolic syndrome could potentially be a culprit. But there are a few individual foods and nutrients that deserve special mention, either for better or for worse. Sugar (specifically fructose, and especially high-fructose corn syrup) has been batted around for years as a potential cause of hypertension. In rats, mice, and dogs, increasing dietary fructose is a known way to stimulate hypertension, although it takes longer for mice than the other two species. These animal studies suggest that eating more fructose causes your small intestine and kidneys to reabsorb more salt and water, raising the volume of blood in the arteries. Supporters of the fructose theory also claim that the high fructose load in the Western diet may also contribute to high blood pressure by causing hyperuricemia, an unhealthily high level of uric acid in the blood. Hyperuricemia is a good predictor of risk for later hypertension, but it’s not clear that one causes the other. Presented at the symposium “Fructose, Sucrose and High Fructose Corn Syrup. Modern Scientific Findings and Health Implications,” held April 22, 2012, at the ASN Scientific Sessions and Annual Meeting at Experimental Biology 2012 in San Diego, CA. The symposium was sponsored by the American Society for Nutrition and supported in part by an educational grant from the Corn Refiners Association. Author disclosures: J. S. White: As a consultant and advisor to the food and beverage industry in the area of nutritive sweeteners, the author receives compensation from scientific societies, research institutes, food industry councils, trade organizations, and individual companies. This is hardly likely to be an unbiased approach! Or take another study (also free full-text) claiming to exonerate fructose. Scroll down to the Disclosures section: four of the authors are researchers on an “unrestricted research grant from the Coca-Cola Company,” and several of the others get funding from companies like Pepsi, the Coca-Cola Sugar Advisory Board, and Unilever (the world’s biggest ice cream manufacturer, responsible for Popsicles, Ben & Jerry’s, and Breyers, among other brands). A study finding that only hypercaloric fructose intake had any effect on uric acid was also conducted by many of the same researchers, also receiving funding from Coke, Pepsi, and various other processed food companies. In other words, what we have is conflicting evidence. On the one hand, it’s well documented that intake of sugar-sweetened drinks is a huge predictive factor for hypertension. Using various animal models of fructose absorption, researchers speculated that the fructose used to sweeten the drinks was the problem. On the other hand, the soft drink industry started from evidence that fruit is actually protective against hypertension. From there, they concluded that fructose itself must be fine and that it’s only added calories that are dangerous, so there’s nothing wrong with Coke after all. The problem with the industry argument is that fructose from sugar-sweetened soft drinks is a source of added calories. More than 40% of the US sugar intake comes in the form of sugar-sweetened beverages, and consumers add these drinks on to a meal without taking anything else away. If you provided isocaloric amounts of Coke and steak in a lab experiment, you might see no effect, but in the real world that’s not how human beings drink Coke. So does fructose by itself raise blood pressure? Not in its natural form. Fruit is perfectly safe to eat, and even beneficial for blood pressure because it’s a good source of other minerals like potassium. But sugary soft drinks are definitely a source of fructose to avoid. So far we’ve touched on foods that can contribute to high blood pressure, or to the underlying factors (like obesity and insulin resistance) that lead to it. But what about therapeutic foods that can help treat the problem? One of the ways that conventional doctors treat high blood pressure is through diet, but the dietary recommendations for hypertension take the familiar “whole grains, low fat” line that we’re all too used to hearing. Especially since hypertension is so strongly associated with metabolic syndrome, this might actually be very dangerous! The available evidence supports the idea that high carb is not better – in one study a low-carb diet was much more effective than a plain weight-loss diet at treating blood pressure. Some research has even been done specifically on Paleo: this study had a small sample size but reported a significant reduction in blood pressure on a Paleo diet. Another small study found a small decrease in systolic blood pressure after 3 weeks on Paleo. This study also had a small sample size, but it’s interesting because it found a reduction in diastolic blood pressure on a Paleo diet compared to a traditional diabetes diet, even with no reduction in salt intake. In other words, a Paleo diet is a safe and effective way of eating for people with high blood pressure. This probably has to do with a lot of factors, including better insulin control, weight loss, more potassium from fruits and vegetables, and less processed food. Essentially, Paleo removes the modern food toxins that contribute to metabolic syndrome and the related constellation of problems, which include hypertension. It’s a systemic answer to a systemic problem. From the information that we have about the causes of hypertension, a Paleo diet and lifestyle seems to be an effective, simple, and safe way of treating high blood pressure. There are also some tweaks to the diet that can make it even better, including supplements and specific lifestyle changes that show some effectiveness in treating hypertension. Minerals: These minerals act with sodium in the body to regulate blood pressure. Remember that the real problem with salt isn’t the salt itself, but the balance between sodium and other minerals. Paleo is naturally rich in these minerals, but supplementing may also be useful. Potassium: sodium-potassium balance is much more important for regulating blood pressure than sodium alone. This is probably why diets like the USDA-approved DASH (Dietary Approaches to Stop Hypertension) diet work so well: they’re full of potassium-rich fruits and vegetables. Calcium may also help, although the evidence is weaker. Magnesium may be helpful, and it certainly seems like a plausible link (magnesium is a relaxant, stimulating the parasympathetic nervous system), but there’s not enough evidence to be sure yet. Vitamins and Antioxidants: High blood pressure is closely connected with oxidative stress and inflammation, so supplementing with vitamins and antioxidants may have some benefit. Vitamin D supplementation is a good idea for everyone, and may also provide some benefits for blood pressure. Vitamin C is an antioxidant, and another reason why fruit may be beneficial for hypertension. Coenzyme Q10 (COQ10) is another antioxidant. It lowered blood pressure in some patients, although some studies found no effect. Aged garlic extract showed serious benefits for patients who otherwise couldn’t control their blood pressure. Hibiscus tea is easy to get and tasty to drink. Chocolate (the “supplemental food” everyone always wants to hear!) has a small effect, the darker the better. Breathing exercises, are an effective, safe, and free therapy that anyone can do. Deep breathing activates the parasympathetic immune system, which turns on the “rest and digest” mode and turns off the “fight or flight” response. Even if you don’t have any blood pressure problems, these exercises are an easy way to relax after work, or add a bit of sanity to the middle of a hectic day. Hypertension is definitely a “disease of civilization” influenced by the perfect storm of the modern sedentary lifestyle and sugar/grain-based diet. This makes a Paleo diet the approach most likely to be therapeutic. On the other hand, hypertension also has a genetic basis, so Paleo by itself is not a cure-all. Since it’s such a variable condition, everyone’s situation is different: find something that helps for you, and work with your doctor to make it happen. In general, when you’re living with hypertension, it’s also important to speak up on your own behalf. Blood pressure can fluctuate a lot, and some people have abnormally high readings in the doctor’s office just because they’re stressed out about being there. If your doctor wants to send you home with a prescription, try buying your own blood pressure cuff and doing a self-experiment with some more data points. Sometimes you do need to take meds, but there’s no reason to take medication for a problem that doesn’t actually exist! Also, read up on the conflicting evidence about how well blood pressure medications actually work before you decide to take one. For some people, these medications might be necessary and helpful, but it’s worth at least trying to manage your blood pressure with diet and lifestyle interventions first.